Nine new radar images of near-Earth asteroid 2007 PA8 were obtained between Oct. 31 and Nov. 13, 2012, with data collected by NASA's 230-foot-wide (70-meter) Deep Space Network antenna at Goldstone, Calif.
NASA has unveiled astonishingly detailed radar views of a mile-wide asteroid that zipped safely by Earth this month — its closest approach to our planet until the year 2488. Astronomers with NASA's Jet Propulsion Laboratory in Pasadena, Calif., used the agency's Deep Space Network antenna in Goldstone, Calif., to record nine new images of asteroid 2007 PA8 between Oct. 31 and Nov. 13 as it made its nearest pass by our planet in more than a century. The images reveal that 2007 PA8 as an elongated, asymmetrically-shaped space rock, with possible ridges, craters and even boulders on its surface, according to JPL officials. The pictures also show that the asteroid rotates very slowly, about once every three to four days. The moment of the space rock's closest approach occurred on Nov. 5 at 11:42 a.m. EST (1642 GMT), when it zipped by at a range of 4 million miles (6.5 million kilometers), or 17 times the distance between our planet and the moon. On that day and on Nov. 6, astronomers captured images of the asteroid with resolutions as detailed as 12 feet (3.75 meters) per pixel. They achieved a resolution of 25 feet (7.5 m) per pixel on Nov. 2, 3 and 8, and 62 feet (18.75 m) per pixel on Oct. 31 and Nov. 11 to 13, JPL officials wrote in a statement. 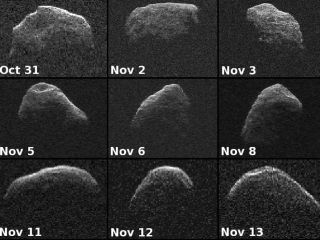 The new radar photos follow earlier images of asteroid 2007 PA8 from a NASA observation campaign between Oct. 28 and 30. This composite image of asteroid 2007 PA8 was obtained using data taken by NASA's 230-foot-wide (70-meter) Deep Space Network antenna at Goldstone, Calif. The composite incorporates images generated from data collected at Goldstone on Oct. 28, 29, and 30, 2012. The recent flyby marked asteroid 2007 PA8's closest since 1880 and astronomers say it won't make a closer pass for another 476 years. In the year 2488, the asteroid is expected to approach Earth at about 3.6 million miles (5.8 million kilometers) away. This asteroid is classed as a near-Earth object. Scientists with NASA and other agencies regularly track and study such space rocks to determine whether any pose an impact threat to our planet.